Last week we learnt that the upmarket supermarket (well their prices are up-market!) 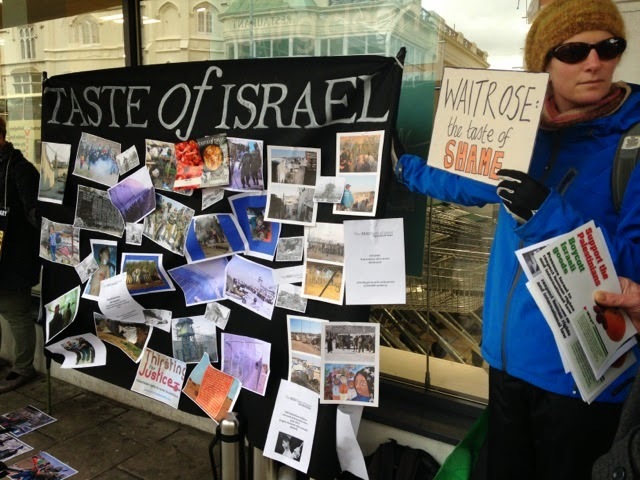 Waitrose, a supermarket that flaunts its ‘corporate social responsibility’ and its egalitarian employment practices – has teamed up with the Israeli Tourist Board to produce a special glossy insert for ‘Waitrose Kitchen’, their customer magazine. 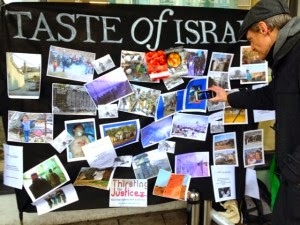 The 32-page insert is called ‘Taste of Israel Guide’, and is a shameless progaganda vehicle for the ‘Brand Israel’ project. You can find out more here. 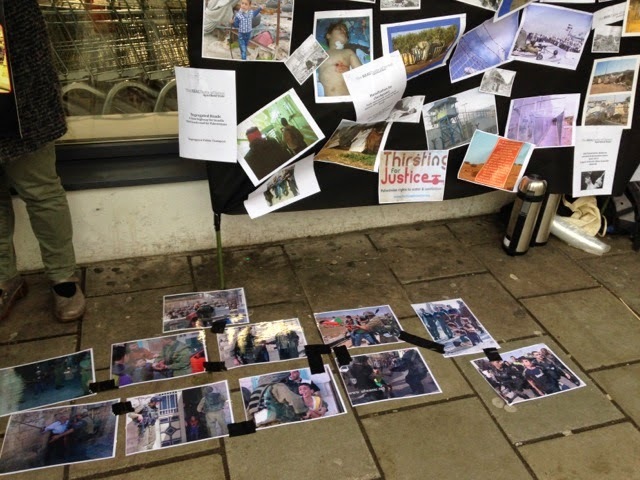 On Saturday Feb 21st Brighton Palestine Solidarity Campaign pitched its weekly Saturday stall outside the Waitrose branch in Western Road – not far from the shop formerly known as EcoStream, which we closed down last year, in order to expose Waitrose’s complicity in the attempt to normalise Israel’s appalling record of human rights abuses and violations of international law in occupied Palestine. 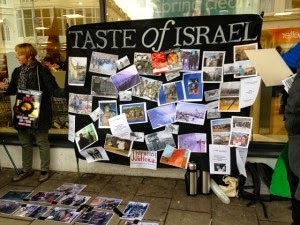 Beneath the title of the Waitrose/Israel magazine ‘Taste of Israel’, we displayed photos of Israel’s occupation – the wall, demolished houses, arrested children, checkpoints, and shocking photos of Israel’s brutal assault on Gaza last summer – showing the true tastelessness of the company’s partnership with the apartheid regime. 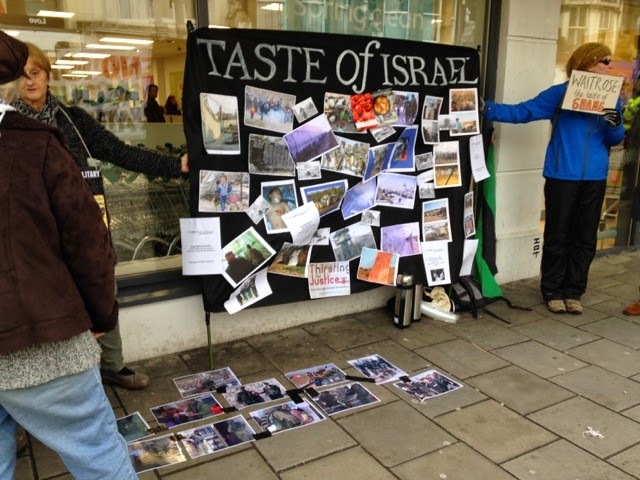 Many Waitrose customers were genuinely disgusted to discover that their supermarket had allowed itself to be used as a pawn in Israel’s well-funded programme to prettify its image abroad as an attractive tourist destination for British foodies. We and others around the country will continue to put pressure on the company until it withdraws its tasteless publicity for ethnic cleansing and withdraws from its partnership with Israel. PALESTINE supporters have slammed an attempt by Israel’s propaganda machine to promote the apartheid state in co-operation with a British supermarket chain. 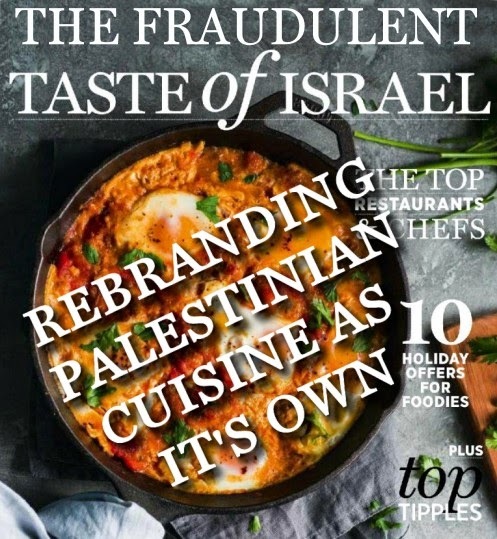 Waitrose and Israel’s Tourist Office are to produce a 32-page food and travel guide promoting Israel in Waitrose Kitchen magazine. Oblivious to the Occupation or Israeli Apartheid we have pages on ‘The history and culture behind Israel's culinary creations’ in a situation where Israel is notorious for claiming that traditional Arab foods and recipes are its own, Why Israeli craft beer is making a name for itself (clue: it’s blood red) instructions for creating the perfect falafel and hummus (both stolen foods stolen from the Arabs). We are told that the Waitrose Kitchen magazine has 680,925 readers. Presumably Waitrose would have had no problem producing a similar magazine with a certain Aryan state 80 years ago.